Our motion-sensing controller, with a wearable accelerometer. Motion-sensing controller box, with a power bank, arduino, and bluetooth module. 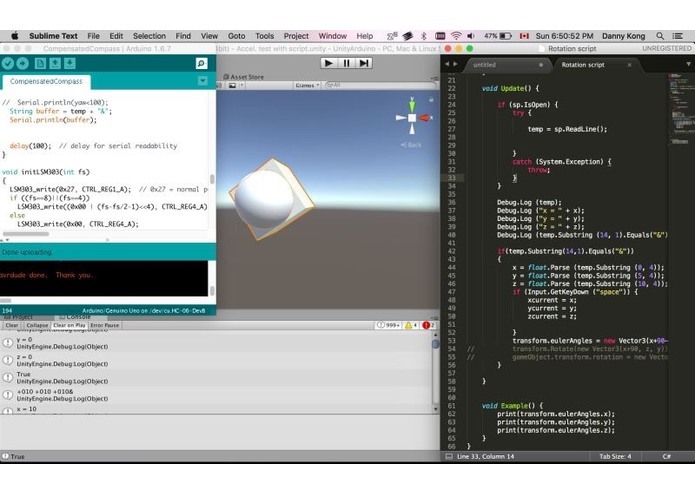 Tracking the motion of the accelerometer with Arduino and Unity. City Therapy VR is a low-cost, accessible virtual reality physical therapy treatment. Current physical therapy routines for broken bones and replaced hips are dull and painful, with no method of distraction or motivation. With the $20 Google Cardboard, a smartphone, an Arduino, an accelerometer sensor, and a bluetooth module, patients can look forward their daily physical therapy routine, now a city-building virtual reality game controlled by the movements of the limb being stretched. Our current demo is designed for two physical therapy exercises prescribed to a broken arm– rotation of the wrist and extension of the arm at the elbow. In the Cardboard headset, the patient is introduced to the game, where they become a mayor at a desolate city they must rebuild. With rotation of the wrist (captured by the wearable accelerometer), the player clears the existing skyscrapers and with extension of the arm, raises buildings from the ground. As the therapy progresses, the game encourages greater range of motion with a reward system. The greater the angle of movement, the more efficiently the buildings will be destroyed, and the more the created buildings will tower over the others. How does it work? The wearable accelerometer sends information to an arduino to process the data into usable numbers which are then fed into Unity by the bluetooth module. The data allows the player to interact in the game, building or destroying his or her city. INSPIRATION One of our teammates’ grandmother needs physical therapy for her hip but doesn’t do the daily exercises not only because of the pain but also because of its dull nature. Our classmate and hackathon opponent, Maggie, also recently broke her arm while ice skating but doesn’t perform her nightly simple wrist twists. Seeing people all around us disregard their prescribed exercise, we were inspired to make it a more fun and engaging endeavor. If physical therapy can have a game component, wouldn’t it be easier for patients to do their exercise and get better faster? In comparison to most health care components, our solution is also cheap and affordable: all the user needs is our wrist-brace, a smart phone, and a Google Cardboard headset. HOW WE BUILT IT Our initial prototype is built primarily for people with a broken. Considering that our classmate currently has a broken arm and must undergo physical therapy, we chose her as our user tester and designed the experience around her needs. The accelerometer and compass gathers data, and is sent to the arduino. 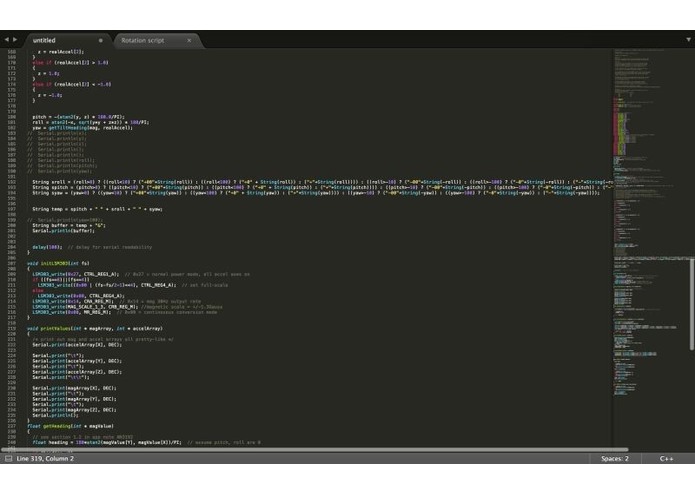 The arduino processes the raw data into easy to understand values, before sending it through the bluetooth module to Unity. Unity checks the variables to see what movement has been made and then tells the game to respond accordingly. 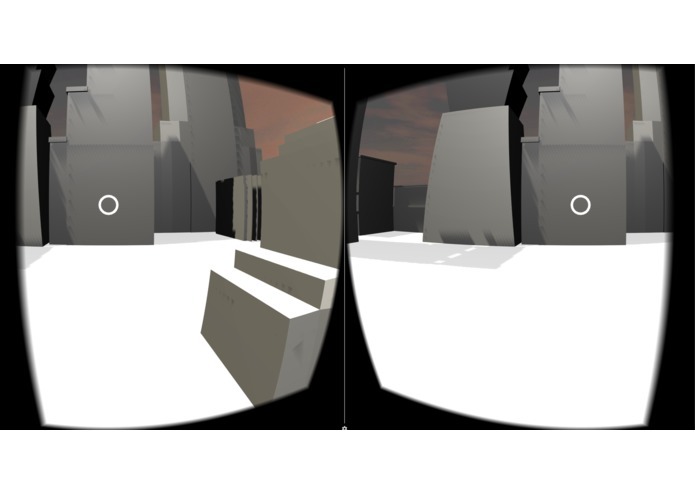 If the person turns their wrist left to right while looking at a particular building in Google Cardboard, the building gets destroyed. If the person raises their ulna up to their humerus, another building gets raised up. Thus we incorporate the game element somewhat similar to an open sandbox game where the player has the freedom to do what they cannot do in real life. WHAT’S NEXT FOR CITY THERAPY VR: We hope to expand our game so that it gets more difficult over time as well as develop a more nuanced experience for people who have to undergo all types of physical therapy whether it is learning to use an arm again or learning to walk. I took the sensor developer's library which outputted the raw sensor data and added a math component to calculate the orientation of the accelerometer, and turned it into a useable piece of hardware for our purposes. I formatted the output and I then made a unity script that integrated the arduino output into the demo game.